This week has been a fun one! I've finished up the major planning of my course of study, and am beginning to put it into action. One of the experiments I am trying is to use a game to incentivize my study - both the frequency of it, as well as the diversity of methods that I'm using. The game is called Omuzanyo, which just translates to "Game," and its point is to track effort, not proficiency. Proficiency will still be assessed in the manner I described in my independent study plan, and is still important to measure. 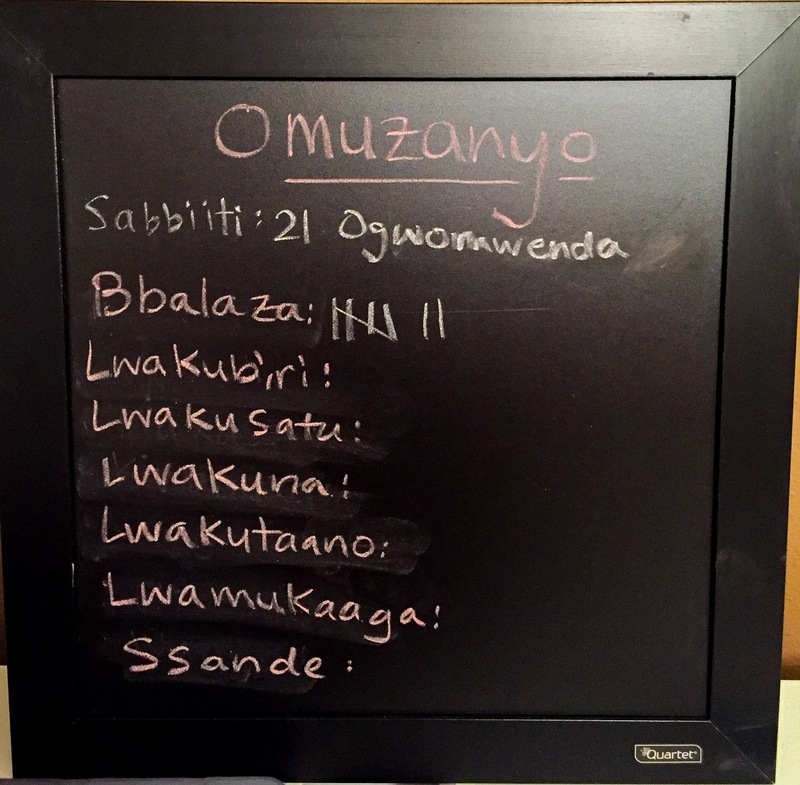 For Omuzanyo, I will keep track of my points on a daily basis. I have set a target of 70 points per week (which I am measuring from Monday - Sunday, in the same fashion that the Baganda consider the week). I don't know yet if this number is realistic while still pushing me to put in a lot of effort, or if it sets the bar too low, or if it's just right. I am taking the next two weeks to see how it goes, and will reassess then whether or not it's the right weekly target. I put a lot of thought into how to assign points to activities. I wanted to reward intensive effort with more points, but not discount the value of less-direct types of learning. I also wanted to account for the value of Luganda in the real world; for example, the body language that I might pick up from watching a video in Luganda. I very much expect this current point system to change as I figure out what makes sense and what doesn't. I also expect to add new activities to this list as I discover new ways of learning. But, for the sake of transparency, here is the first draft! Let me know what you think. Does the point system generally make sense? What activities should I add? I will keep this blog updated about my experience with Omuzanyo and how it develops over time. In addition to the focus on the development (and playing of!) 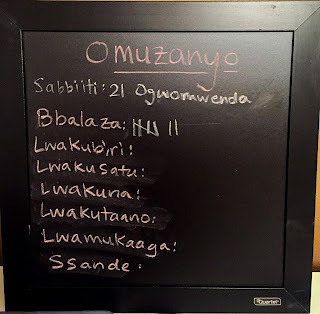 Omuzanyo this week, I have begun to actually work on my Luganda skills in earnest. It has been fun! I've got my numbers down now, and am working on days of the week (which are closely related to numbers). I also started my first lesson in the workbook, which is focused on greetings. The basics haven't been too bad yet, but then again, it's all about as basic as it gets. We'll see what the next week holds as I graduate to slightly more complicated!